Starbucks Hot Cocoa- As Good as their Coffee? Delicious dark chocolate taste with less sugar and preservatives. The salted caramel flavor is out of this world. The 30 oz. 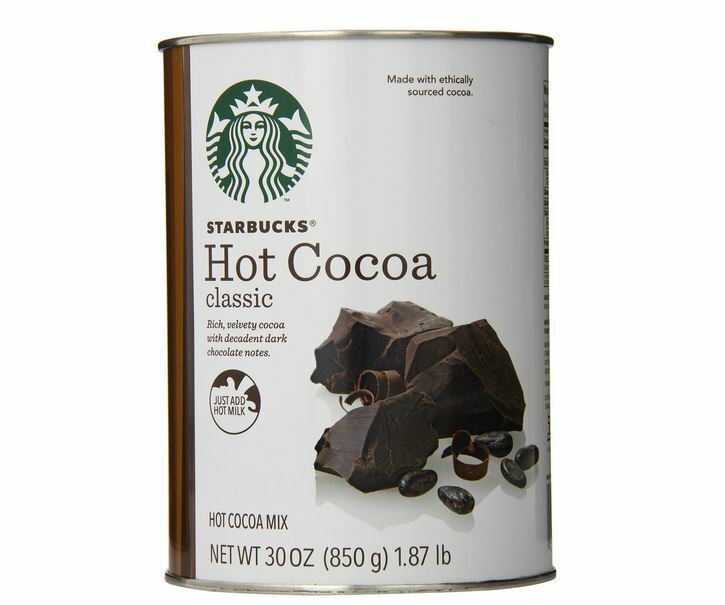 Classic hot cocoa tin is a great deal for the money. 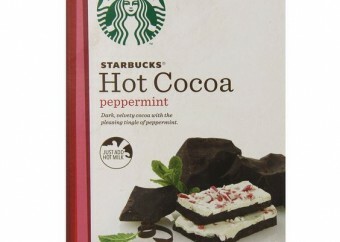 This hot chocolate mix exudes the quality that we have all come to expect from the Starbucks brand. Even with the marshmallow flavor hitting a bit of a sour note, the classic and salted caramel versions are so good that they have wiped the memory of that less than stellar flavor from my mind. If there is such a thing as a "healthy" hot chocolate mix, this is it. And if you are a dark chocolate enthusiast like me, the deep velvety richness of this hot cocoa is hard to resist. So don't! Ah, just the thought of Starbucks conjures up the rich aroma of coffee grounds and hands wrapped around a warm mug of deep, rich coffee. Well, not for me, but for my husband who is a Starbucks addict. He has to grind his own beans of course, (don’t ask me why) and adds just a touch of milk and 1 teaspoon of sugar to a huge cup of coffee. When I have coffee (rarely), I add so much cream and sugar that I worry for my health. Maybe that’s why hot chocolate is more my speed. I love the sweetness of hot chocolate, but it can’t be too sweet, (I know, I know, I’m picky). Swiss Miss and Nestle hot chocolate don’t do it for me but I had yet to find a reasonably priced hot chocolate mix just for me. Something with a dark chocolate flavor, deep, rich, not too sweet, but not bitter either. 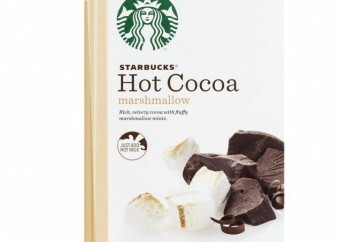 Well, smart and savvy Starbucks somehow has the finger on the pulse of the people because they recently came out with a line of Hot chocolate available at select retailers. Do you think they knew that people like me were waiting to pounce on this product the minute that it arrived in stores? Yes, I think they knew. The Hot Caramel flavor is the first one I picked up at my local grocery store. It comes in a package of 8 individual envelopes, and, at least where I shop, the price is more than double what competing brands are selling for. I winced a little at the price, but, it was deep winter and I was cold, so I threw all caution to the wind and purchased it. 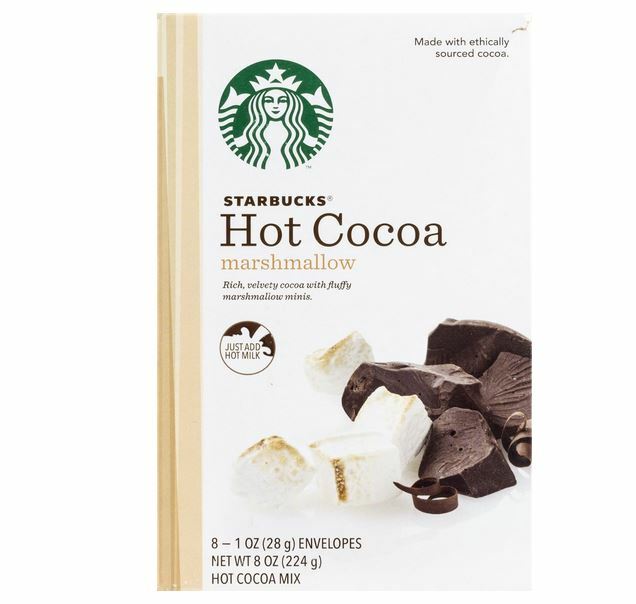 The price was a lot higher than my typical Swiss Miss purchase but having no doubt that this would be better suited to my taste buds, I justified it by resolving that this Starbucks hot chocolate mix would be for me, and me alone. My less choosy kids could enjoy their Swiss Miss mix, which I never partook of anyway. Ok, guilty feelings compartmentalized, I heated my almond milk to boiling on the stovetop and added it to my mug of hot chocolate. The taste was bold, with just the perfect amount of sweetness because of the caramel flavoring and there was an interesting twist that came with the saltiness (which was very muted). In short, it was heavenly. To me, it was the perfect cup of hot chocolate and everything I had been looking for…. and some things I didn’t know I had longed for (the salted caramel was an unexpected delight). I knew, however, without a shadow of a doubt, that my kids would not like this mix as much as I did because the more kid-friendly Swiss Miss and Nestle brands are a lot sweeter. So be forewarned: This is no Swiss Miss. If you prefer the sweeter hot chocolate mixes, this may not be the mix for you. On to the marshmallow mix. I drank more hot chocolate in the space of 2 weeks than I ever had before, so a couple of weeks later, when it was time to replenish my supply, I decided to give the marshmallow mix a try. I want to say this as kindly as I can. The Marshmallow mix and I are not friends. I tried having this hot chocolate mix a few different times and the results were always the same. The taste was too bitter for me. I ended up having to add in more sugar or other sweet flavorings to make it more to my liking, which was fine, but after having experienced the deliciousness of the Salted Caramel mix, I was spoiled beyond repair. I would simply go back to the Salted Caramel Mix. The only problem was, my store was sold out of the salted caramel flavor. Oh joy. I guess other people caught on. 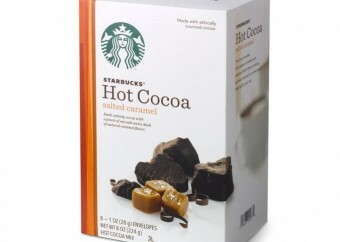 When I asked my sister which mix she used, out came the The Starbucks Classic Hot Cocoa Mix. At a pretty large 30 ounces, and sold at Costco for $14.99, (the price depends on which region of the country you live in) it was a pretty good deal for the price. The biggest surprise for me, however, was that everyone loved it. Everyone including the kids. The chocolate flavor was rich and velvety, with deep, bold undercurrents of dark chocolate, but there was none of the bitterness that I tasted in the Marshmallow version. This version tasted sweeter, even milder and like I said, even the Swiss Miss brigade (my kids) loved it and drank every drop. 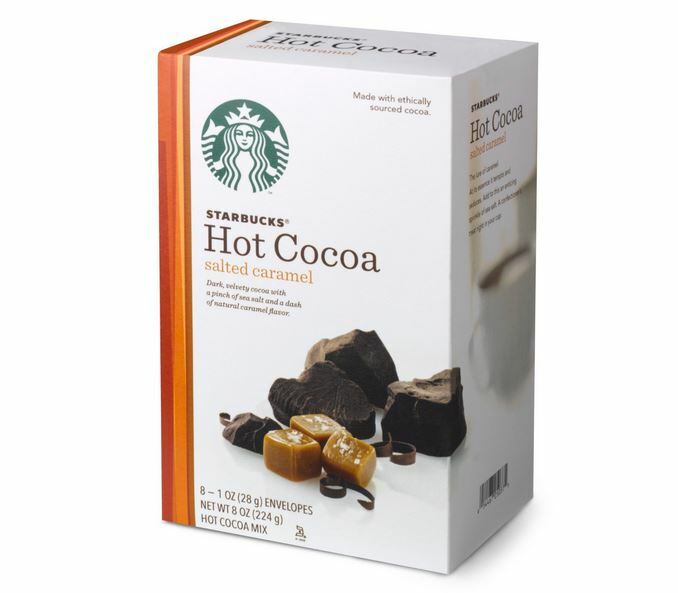 I guess I was wrong to think that the kids would not like this and I underestimated how good this Starbucks Hot Cocoa mix really is. Since the kids like it, I am thinking of switching them over to this hot cocoa mix for good. Sugar, cocoa (processed with alkali) and vanilla powder. Simple. And these days, simple is good, simple translates to healthy. What kind of milk do you use? My household gave up drinking cow’s milk long ago for health reasons. So we have had to turn to other alternatives. Having tried a variety of different types of milk with this hot chocolate mix, I definitely think that cow’s milk tastes best with it. However, if that is not an option for you. I found that Almond milk and believe it or not, rice milk, are very tasty alternatives. I tried unsweetened almond milk and undoubtedly, this hot chocolate mix tastes better with sweetened or vanilla almond milk. However, if you choose to use unsweetened almond milk, I might suggest to add a teaspoon of sugar or Xylitol ( an all natural sugar substitute) for a little more sweetness (especially if you are serving this to kids). By far, however, my favorite type of milk with this hot cocoa is rice milk. It is perfectly sweet and light, not as heavy and thick as the almond milk, and melds perfectly with the hot chocolate mix, I might even go so far as to say that it enhances the flavor of the mix. Starbucks offers 2 other flavors that I have not had the pleasure of tasting yet, but be assured that I will and will update this page once I do. 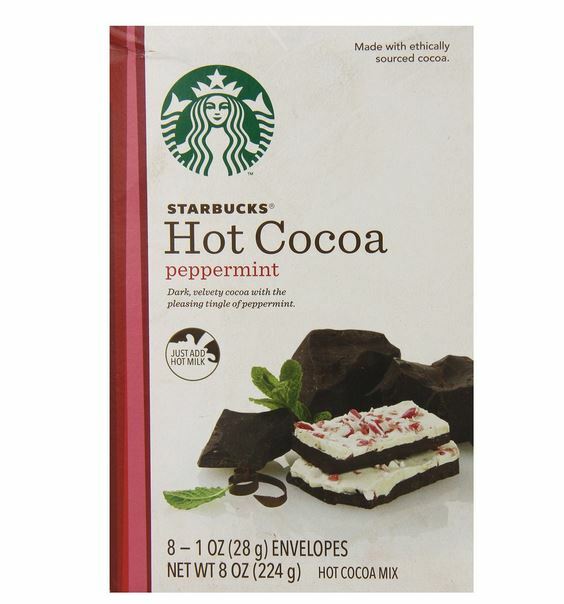 The Peppermint and Double Chocolate Flavors look delicious indeed! 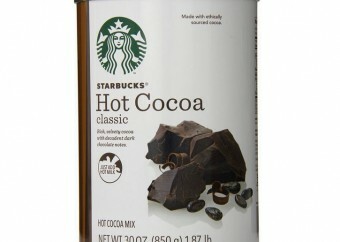 I am still making my way through my classic hot cocoa Starbucks jar. I like the value of it (I’m not even a third of the way through it yet and I bought it over 2 months ago!) But I think that when I am done with this jar, I may go on another hunt for the Salted Caramel flavor of Starbucks hot cocoa. Far and away, that is the best hot chocolate mix that I have ever had. Starbucks lives up to their name and reputation yet again. I love to sample a little of all that life has to offer.